Convenience & Impulse Retailing is designed to help convenience retailers to improve their commercial performance in all areas of business. It’s a hands-on management guide that covers retail store lay-out, consumer packaged goods, forecourt, impulse retailing as well as convenience food. Well researched articles in a relaxed editorial style deliver the perfect mix of hard information, industry news and entertainment in a glossy full colour publication that is highly regarded by the industry. 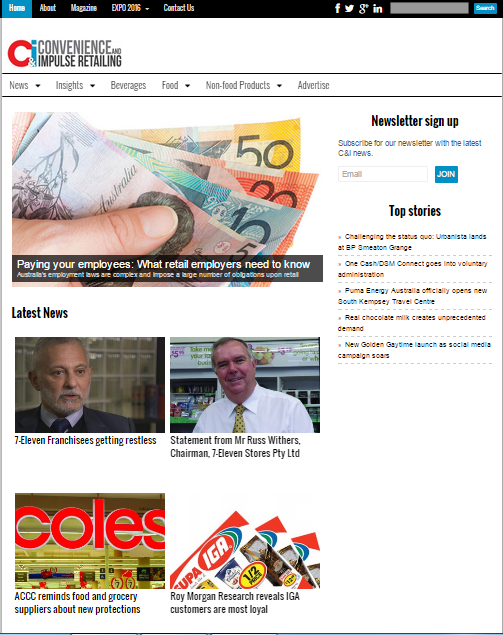 Convenience & Impulse Retailing is the only retail industry magazine to stage its own national industry exhibition. Held every second year, the Australian Convenience Store Exhibition and the Australian Forecourt Exhibition represent the largest events of their kind in the southern hemisphere.